Earth's End: Terry Teo Returns! Revealing the return of a classic kiwi icon, and a tie-in edition to the new TV series Terry Teo, to air soon on TVNZ! 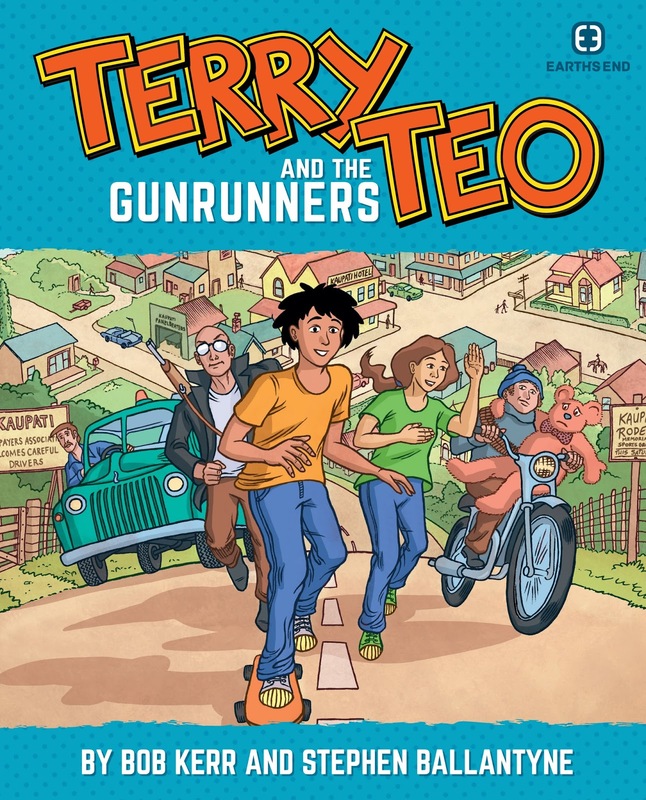 Earth’s End Publishing is proud to announce the return of the classic kiwi kids graphic novel, Terry Teo and the Gunrunners by Stephen Ballantyne & Bob Kerr, to be published on the 6th of November 2015. Originally released in 1982 as Terry and the Gunrunners, this distinctly local take on the Tintin graphic novel format was an instant hit with children across the nation. The popularity of the book made Terry an instantly iconic kiwi character – inspiring two sequels, and the much loved television adaptation, Terry and the Gunrunners (1985), starring Adrian Bell, Michael Bentine and Billy T. James. 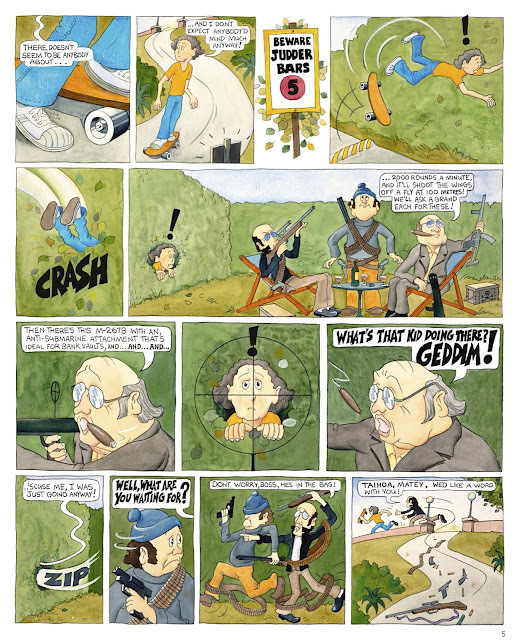 This new edition has been digitally remastered and restored from the original artwork and archives, allowing readers to experience Terry’s first adventure in vibrant watercolour – capturing all of the detail and delights of this action-packed, family favourite adventure! Above: Remastered artwork by Bob Kerr from Terry Teo and the Gunrunners. There is also an exclusive behind the scenes look at the history of this kiwi icon, and the brand new TV series, Terry Teo (2015). Due to air soon on TVNZ, the new series is produced by Gerard Johnstone and Luke Sharp, the team behind the recent hit movie Housebound (2014). Starring Kahn West as Terry Teo, Kimberley Crossman and Michael Hurst, the series is produced by Semi-Professional Pictures. Above: A first look at the new Terry Teo TV series cast. 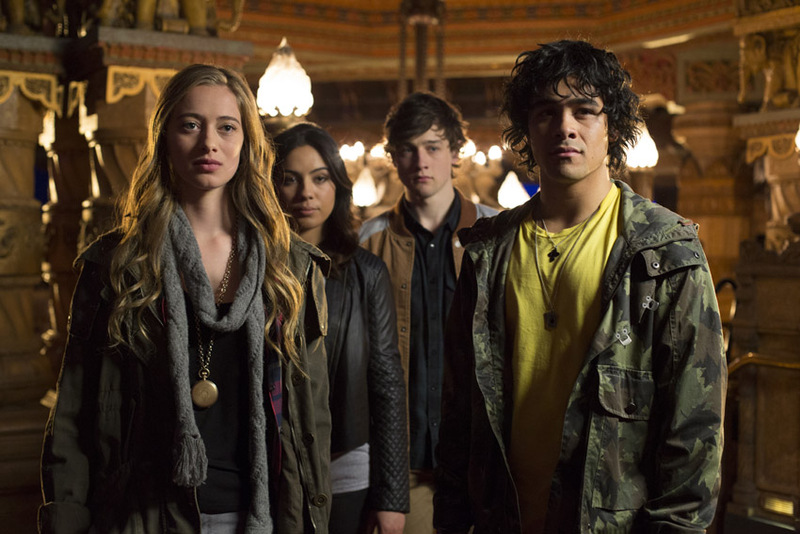 From right: Kahn West as Terry Teo, Drew Brice Ford as Caleb, Hanna Tevita as Polly, and Manon Blackman as Penelope Butterworth. Copyright Semi-Professional Pictures 2015. The continued interest in this classic character came as a pleasant surprise to Terry Teo artist and co-creator Bob Kerr. “We weren't thinking about any of this when we started. We were probably rather naïve. We just wanted to create a story featuring some local kids having a ripping adventure with heaps of laughs along the way, and somehow that connected with readers. Steve and I are delighted that Terry has been remembered, and that 30 odd years later he is having another outing both in print and on the telly”. 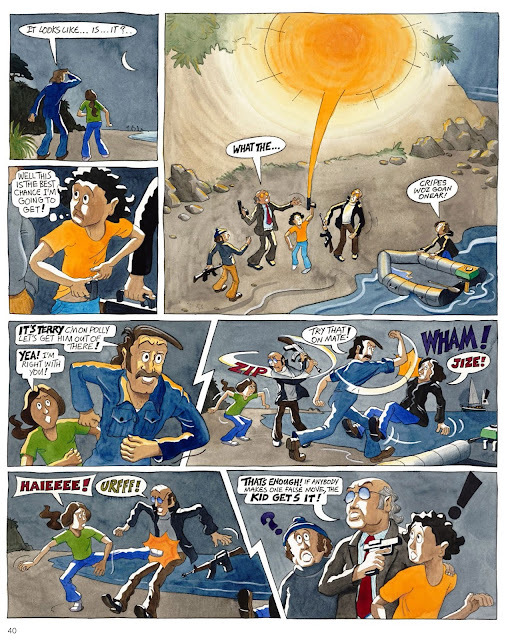 Terry Teo is not your average schoolboy - he's a skateboarding super-sleuth about to embark on his very first adventure! When he stumbles headfirst into the criminal schemes of the villainous Ray Vegas, Terry finds himself embroiled in a dastardly gun smuggling operation. Along with his karate-chopping sister, Polly, and older brother Ted, Terry must use all his street smarts to avoid Vegas' henchmen, defeat the smugglers, and save the day! Copies of Terry Teo and the Gunrunners are now available for order from Earths End Publishing. Email: earthsendpublishing@gmail.com.Please do not hesitate to contact us if you have any queries or require further information. You can also follow us on Twitter: @EarthsEndComics and Facebook: www.facebook/EarthsEndPublishing. Be sure to check back here soon for further updates and exclusive preview material!